SecretBuilders Builder Logs: Don't Miss Our Wii Winner Party This Friday!!! Don't Miss Our Wii Winner Party This Friday!!! 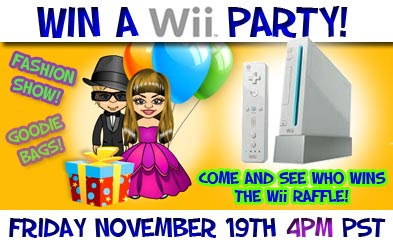 Come to our Wii Winner Party and see who wins a Wii from our raffle! Anyone who has a raffle ticket could be the big winner, plus, there would be goodie bags for everyone. This Friday, November 19, at 4pm PST. Follow the Fashion Show signs.